Surprisingly enough, we are spending much more time watching TV. Likewise, entertainment at home is still TV. From this year, digital broadcast has started, therefore, we may likely be nailed in front of TV more and more. Especially for the aged, this trend may be apparent. It is quite a pleasant scene that the aged enjoys TV with their family in the living room, yet, in reality, due to their hearing ability, in many cases, the sound volume is too large. Such a situation is never happy for the rest of the family. 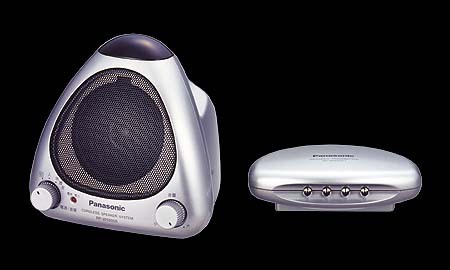 This speaker which makes audio signal reach ourselves by means of infrared rays is an invention; monaural sound is amplified by battery, and the size so small. The triangular corners are designed with elegant curves, and a solid grip is attached for moving it with ease. Not only the aged but others can use it at places far from TV, for instance in the kitchen. This is an indispensable product fulfilling our needs with functions ready for the future society.